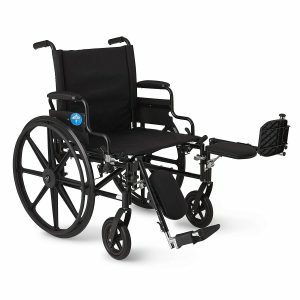 The Medline transport wheelchair is equipped with a huge 12 inch rear wheels to enhance the performance on any surfaces. 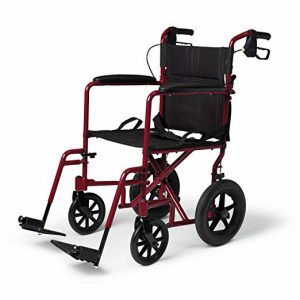 Whether the surface is smooth or rough, this lightweight folding wheelchair works perfectly. It comes with the loop-style manual handbrakes to facilitate effective locking of the rear wheels during movement. The chair comes with a weight capacity of 300 lbs. Moreover, the powder finished aluminum ultralight frame is found to be durable. In order to facilitate easy storage and transportation, its portable back is collapsible. A seat belt is included for safety and the removable armrest is present. To present a convenient seating arrangement, the seat dimensions are 18 x 16 inches. 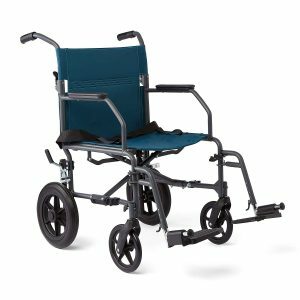 As suggested from the name, this lightweight wheelchair from Medline is user-friendly in nature. With the help of included desk-length arms and flip-back, it is quite simple to navigate under tables. The elevation of leg rests improves comfort while sitting. Its breathable nylon upholstery is found to be comfortable and soft. High durability and reliability are guaranteed with the use of premium welds. This innovatively designed wheelchair is easy to maneuver. Besides, it is made sufficiently sturdy to support people who weight up to 300 pounds. For on-the-go users who wish to attain simple access of flip-back desk arms, this wheelchair is ideal. It is found that the adaptable backrest moves vertically for customized support. 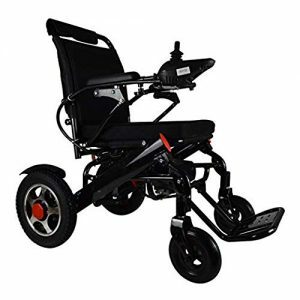 To suit persons with different preferences, this lightweight wheelchair is made available in multiple seat widths i.e. 16, 18 or 20 inches. There are many benefits OF this user-friendly wheelchair. First of all, it alleviates pressure and increases comfort with elevating the leg rests. The included nylon upholstery is found to be lightweight and more breathable compared to vinyl. Overall, this wheelchair is excellent for office work and dining. 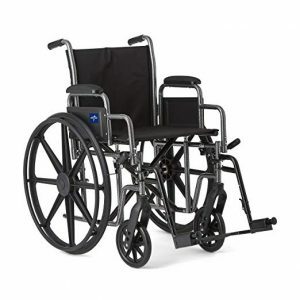 This super lightweight premium wheelchair from Medline just weighs 31.5 pounds. 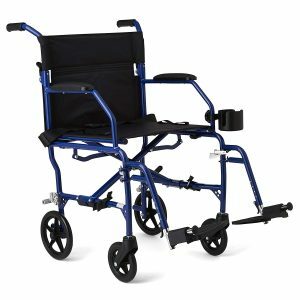 In addition to being lightweight, this high-quality wheelchair is compact, sturdy and very comfortable. Basically, its structure is made unique to slide over the majority of the surfaces. Its structure also depicts a durable nylon seat presented in different choices like 16, 18, 20 or 22 inches of width. In order to offer stress-free access, there is the presence of detachable flip-back. Moreover, the desk arms and the elevating leg rest make sure you get the customized support. It is quite simple to fold-up and goes. The users will find noteworthy improvement in swelling and discomfort with elevating leg rests. 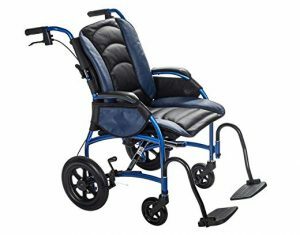 With the use of the swing away foot and leg rests, it is quite simple to get in and out of this wheelchair. The appropriate elevation of the leg rests allows the user to elevate and enlarge the leg position. The transport wheelchair from the Drive Medical just weighs 19lbs but it is a well-built wheelchair. Its design is expertly crafted to effectively and safely support up to 300lbs. The structure of this lightweight wheelchair showcases the 12″ rear flat tires capable to navigate on indoor and outdoor terrain. Besides, the aluminum expedition is found to be reliable and versatile. The simple to use companion-activated wheel locks along with the seatbelt guarantees safety. There is a lever on the back part of the chair to facilitate instant and flat storage and transport. According to your preference, you can easily adjust the footrests’ length and can loosen the bolt present on the telescoping tube shaft. Furthermore, it is possible to securely tighten after adjustment. With the assistance of the handy lever on the back of the chair, it is simple to fold back down. 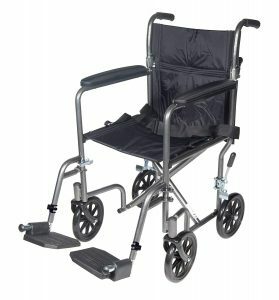 It is the stability and durability of this transport wheelchair from Drive Medical that makes it a suitable product. The use of the durable steel frame also works to maintain the maneuverability of lightweight mobility aid. Its structure is dedicated to offering cushioned armrests and exceptional navigation in contracted indoor layouts. This steel wheelchair is uniquely designed for effortless operation with or without assistance. There are no issues to clean the nylon seat upholstery. Besides, the footrests swing away for flawless mounting and dismounting. The maximum weight sustained is 250 pounds. For easy transportation, the backrest and chair fold flat. 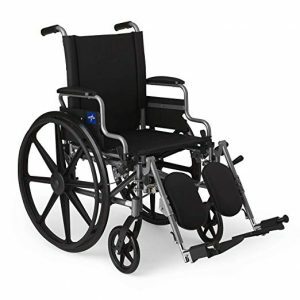 Whenever you insist to get a durable wheelchair with great sitting convenience, go for this sturdy wheelchair. In this wheelchair, the swing-away leg rests work to provide instant access. You will be benefitted with the breathable comfort of nylon upholstery. Also, the presence of removable, desk-length arms helps a lot during office work and dining. There is a well-built steel frame equipped with scratch-resistant finish. This kind of structure makes sure this wheelchair appears sharp and strong. The strength of the wheelchair is enhanced using a durable tig welded frame. With the presence of the semi-height adjustable axles, it is possible to elevate and bring down the seat by 2 inches. Smooth rolling experience is guaranteed through the flat free tires. To enhance longevity, there is the use of hammertone finish. What makes this transport wheelchair exceptional is the inclusion of the Microban antimicrobial protection. This type of protection assists to avoid stains and odors due to mold, mildew, and bacteria. In order to enhance the safety, there is the availability of a seat belt. There are no occurrences of sliding during transportation, so you can sit securely. Smooth sliding experience is guaranteed with the use of giant wheels with locking brakes. Essentially, this lightweight wheelchair is equipped with 12” back wheels to facilitate easy rolling mechanism on rough terrains. 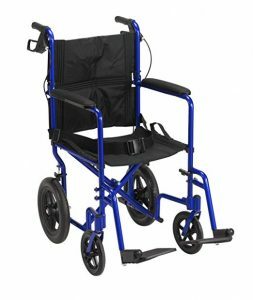 It is directly implied from the product name itself that this transport wheelchair is ultralight and provides excellent mobility. With weight just 14.8 pounds, generally, this wheelchair the ideal choice for indoor and outdoor use. If the needs arise, you can easily move a loved one or an old-aged person around the neighborhood. With the assistance of the stow-n-go clips, the footrests can easily lock to the side when they are not in use. Generally, the standard wheelchair armrests are extremely high to fit beneath tables. On the other hand, this transport chair is exclusively designed with easy-to-use lower armrests. 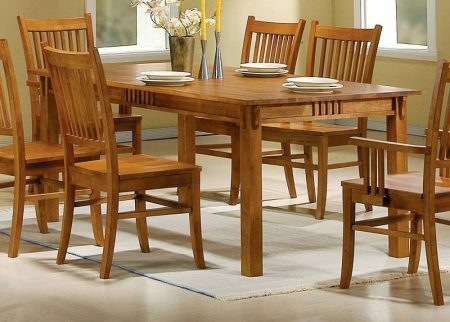 These armrests would conveniently fit beneath most tables presented in the standard height. The back side of this ultralight chair showcases key ring, bottle holder, identification holder, cell phone pocket, and a pocket for a billfold. Designed keeping in mind ergonomic design and lightweight functionalities, this comfortable transport wheelchair makes your investment wise. This lightweight chair from Troy Technologies is prepared with lumbar support to enhance the comfort. Moreover, it comes with a rounded back and enhanced seat angle. In this chair, the presence of the strongback reinforces proper posture in order to avoid slouching. This leads to healthier discs, a sturdy back, and perpetual comfort. There are many users who are concerned about the difficulty of transportation. However, due to its compact size and foldable structure, there are no transportation hassles. It can be folded to 9-22 pounds based on wheel size. With the included Velcro straps, it presents excellent adjustability. This adjustability enables the backrest to fulfill an individual’s needs. There is the availability of two frame sizes. The FDA approved, the easy-to-use wheelchair is recommended for the aviation travel. Its structure is convenient to roll on different surfaces like grass, deceleration strip, ramp, muddy, brick, snow, and bumpy road. Due to its weight being 50 lbs, this electric wheelchair is ultralight and it comes with a lithium battery. With the use of aluminum alloy, excellent strength is assured. It comes with the weight capacity of 360 lbs. Moreover, its climbing ability is less than or equal to 35 degrees. To facilitate smooth transportation, the included tires are solid, inflatable, and wear-resistant. With a comfortable design and sturdy construction, the wheelchair assists a lot in different applications. Also, the weight capacity is higher than the normal chairs. It is quite easy to roll on different surfaces without any compromises.